During the off season, the Philadelphia Flyers landed arguably, the best goaltender on the market, when they signed Ilya Bryzgalov to a deal that will keep him in Philly for the next nine years. Bryzgalov is coming from the Phoenix Coyotes, a team that has seen recent success but has continued to be in jeopardy of relocation due to their ownership problems. Along with the drastic change in temperature and scenery that comes along with a move from Arizona to Pennsylvania, Bryzgalov will see a change in the fan following in his new home. Bryzgalov has left a team that entered the league in 1979, and has not had a steady outlook on the future of the organization for the past several years. The Coyotes, a team that averaged 12,189 people attending each home game in 2010-2011, in an arena with a capacity of 17,125. Not quite a packed house. The Coyotes have never had the league's strongest following but those loyal to the team have stuck through the thick and thins. 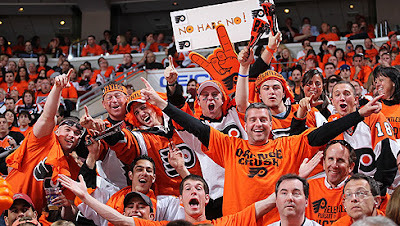 However, the fans in Philadelphia are not the same breed of fan that Bryzgalov may have encountered in the desert. A team that has one of the richest backgrounds in the league and perhaps the most loyal and cold hearted fans in the league awaits Bryzgalov's arrival. Bryzgalov will be coming into Philadelphia as one of the most stable goalies that has manned the crease for the Flyers in quite some time. This hype surrounding the, 31 year old, Russian's arrival is quite high, and if Bryzgalov fails to live up to this hype the fans in Philly wont be to kind. The best way to keep this transition as smooth as possible for Bryzgalov is simple. Win. If Bryzgalov can produce the numbers he put up for the Coyotes, which he should, seeing he now has a better team in front of him, the fans should welcome him into the Wells Fargo Center with open arms. If not, he will encounter a whole new type of fan he never encountered in Phoenix, a Philadelphia sports fan, eek!